It is in eastern Africa, in 1937, that the adventure in the road transportation industry of Antonio Di Nino, the son of Gianstefano, profession: carter, begins: on board his Chevy truck, in the midst of World War II, he sets out to initiate his own haulage business, after serving in the army as a volunteer. When in 1945 his Ford vehicle is seized by the military, Antonio Di Nino decides to go back to Italy, and then to move his activity to Venezuela, where he would live and work, still on his own, until 1952. 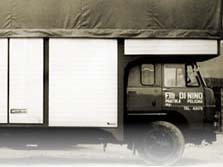 The business has a major expansion in 1973, when Antonio's sons, Piero and Stefano, become involved in the company, now named F.lli Di Nino Autotrasporti and based in Pratola Peligna (province of L'Aquila, Italy). With a larger fleet, finally the new firm has the capability to extend its services to the entire domestic territory. In 1985, the final transformation into Di Nino Trasporti S.r.l. opens up new market opportunities, which eventually lead to the acquisition, in 1997, of Lugo Trans S.r.l. in Cassano d'Adda (province of Milan), a development that would allow Di Nino to cater for the logistic and transportation needs of all the northern regions. All the efforts and dedication put into a lifetime of professional activity are finally rewarded, as Di Nino Trasporti S.r.l. is recognized among the industry leaders. Through perseverance and a typically Italian entrepreneurial spirit, we provide reliable, skilled and punctual road transportation services.